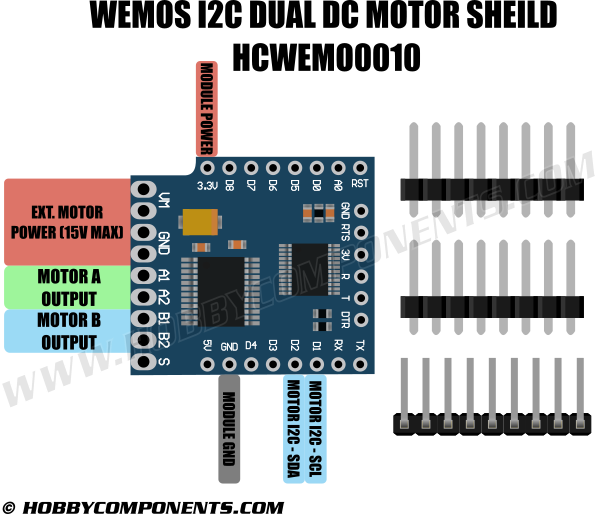 The WeMos I2C Dual Motor Driver Module is designed to be able to drive up to two DC motors from your WeMos mini or mini Pro development boards (See HCWEMO0002). Using PWM the shield is capable of independently controlling the speed and direction of each connected motor with a maximum average of up to 1.2A (3.2A peak). The shield, together with its supplied headers (3 x 10 way supplied unsoldered), allows for it to be easily inserted and removed from the WeMos Mini. Control of the shield is via the WeMos mini's I2C interface which can be configured via solder jumpers to one of 4 I2C addresses (0x30 default). A library and example sketch is provided by WeMos to make controlling the shield from your own sketches as simple as possible. Open: Reset by "DTR" pin. I connected the motor shield as illustrated in the diagram and run the test library but the shield does not start the motor. I've tried an I2C scanner but it cannot find any devices. What type of microcontroller or development board are you using with it? Could you describe whats connected to each pin on the module? Do you have any kind of part number for the motor(s) you are using with it? When connected is anything on the module getting hot to the touch? Andrew - the shields is connected to a Wemos D1 mini. VM and GND are connected to a 7.4V LIPO and the motor is a lego train motor connected to pins A1 and A2. Nothing is getting hot. When running the test sketch, if you open up the serial monitor window do you see any output? This should confirm the sketch is at least running. 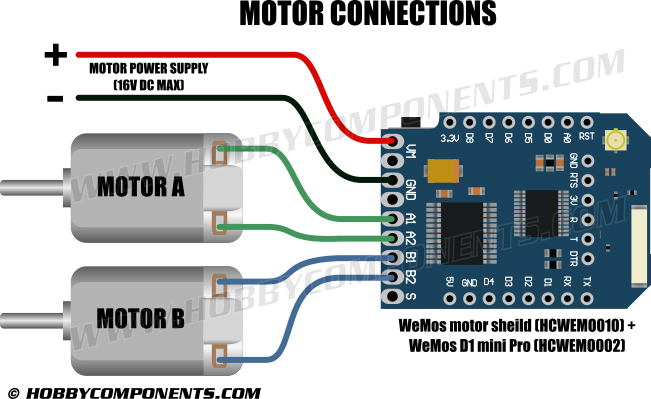 The motor shield is very particular about the format of the data it receives and an I2C scanner will just cause the I2C bus to temporarily lock up. Also any bus data errors could cause issues. Is the shield plugged directly into the D1 or is it connected remotely via some wires? Just as a sanity check, have you confirmed that the motor is working by connecting it directly to your LiPo? Andrew - thanks for checking it out. The serial port does give output and I've had already checked the motor in the manner that you suggested. I'll do some further tests. Andrew - looks like I have resolved the problem. It suddenly started working. Looks like I have a bad joint somewhere. Thanks for all your help - much appreciated. I've connected everything as on the schema above and motor doesn't move. I changed Serial speed to 115200, connected via serial monitor and see that program prints out PWM values, but the motor is still not moving. I've heard that the firmware on the motor shield itself can be broken, could it be the issue? The only issue I've seen mentioned on the Wemos forum is that it is possible for the controller to lock up if an incorrect formatted I2C command is sent to the shield or a timeout condition occurs. This is not something we've seen happen in our own tests. However if that was the problem a simple reset should resolve it. Also, this issue should affect the test sketch in the first post so I think it would be unlikely that was the cause of your problem. If the sketch doesn't work for you then I would suggest checking for a bad connection or bad solder joint on the header pins as this would be the most likeliest cause.